OK YUM. I am a Mexican food addict (how could I not love a culture that uses chocolate in cooking?!) I want to jump through the screen for these! We make this all the time! I love this recipe! It is tasty and so easy and quick to whip up!! Thanks for coming by my blog and following! I am returning the love! BTW I am bookmarking your site, you have SO MANY great recipes!!! Doesn't get much easier than this - and so yummy too!! The kids are going to go bonkers for it. Love Mexican food! This looks awesome! Can't wait to try it! Huuu an enchilada lasagna! Yummy.. I do my own enchilada sause so I can't wait to try it! Do you share your homemade enchilada sauce recipe?? The picture had me at hello! Looks tasty...I love Mexican food and sour cream is one of my favorite add-ons. We tried your honey lime chicken and it was really delicious--great for the grill!! This is outstanding! OMG you've got me in the mood for mexican food! I have got to make this. It looks amazing. I linked to you from Six Sisters Stuff. Thanks for a great recipe that I will be making this week. 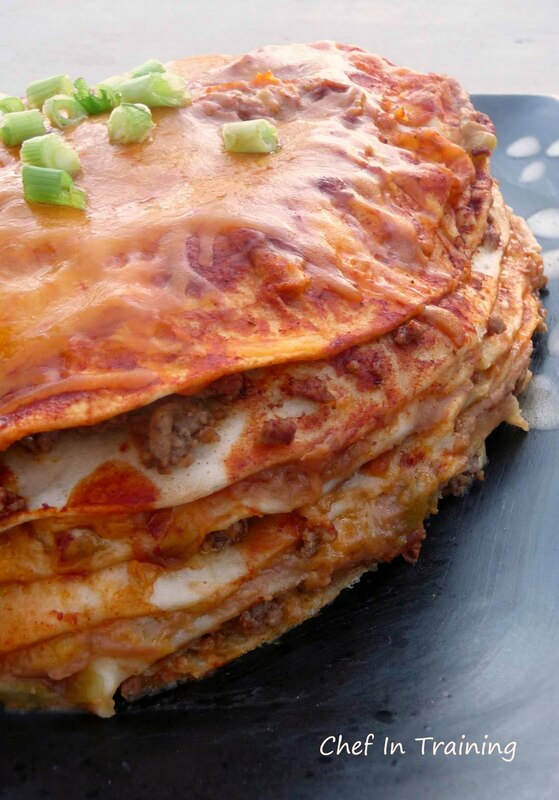 I am going to make this--my husband will love it and I love easy--it is like enchilada lasagne! This looks yummy! We have a recipe that is similar and we serve it with a fried egg on top. (real mexican style, so i hear) with the yolk flavor in addition to the enchiladas, it is to die for! try it out sometime! Yummy! The picture look fabulous I had to stop by. I love the idea of the stack. I'll have to try this soon! Oh... I love Mexican food and I am always looking for great cheesy recipes. Thanks for posting! I am definitely going to try this one! Looks great! New follower to your blog- really enjoying some of these recipes! I will be trying this soon! Thanks! I've made these for years. . .just CORN tortillas, homemade red chile, cheese, onion, shredded lettuce and an egg on top. They way I learned in NM. No hamburger or refrieds. The refrieds are on the side. Made these the other night, and finished the leftovers for lunch today! I love that I could easily adjust the recipe to my own liking (I dont' like onions or peppers) and it still turn out fantastic! looks amazing...im making these tonight but instead of beef im using shredded chicken! I am making this now and it looks so yummy. Has anyone ever made this for a large family? I just wondered how doubling or tripling would work. Tonight it is just for a super bowl get together so just followed recipe. I used larger flour tortillas and made ours for our large family! I made up our taco meat with taco seasoning and made it tonight then just added the enchilada sauce.. we will see if its good! Taco seasoning was a must.. was one of my fams top dishes! Like Mexican lasagna... Good idea. I've made this before but baked it in a springform cake pan rather than a baking sheet... seemed to keep everything contained easily! Definitly going to try this! I made this the other night! It tasted so good! Thanks! wow!!! amazing thanks for the idea :). this my be a silly q considering i am a huge mexican fan but what is in enchilada sauce. never seen it here in south africa? Mindy @ "The Sisters Cafe"
Your pictures are amazing! I love every one. We make a version of this in the dutch oven while camping and call it Enchilada Pie. It always tastes SO good camping. I've never thought to make it at home. I'm inspired! I made this today and my guys loved it! Came across this on pinterest and made it for dinner tonight. So good! Easily customizable and the best part is my two year old ate it (it's hard to find things we can eat together). So glad you posted this! Also, I baked it in a round cake pan, so the whole thing was perfectly contained! I make this to night but I changa it up some. I put a some of the sauce in a different pan and put the tortellas in to get the sauce taste. Then I would top them like you said but didnt do the chiles. I didnt put chese on top of the beens as much as you did. Mine came out really good and was a success in my house. I end up make 3 different stacks of the enchilladas. Try with corn tortillas and shredded chicken too! Yum! Tried this a while back and oh my goodness it's amazing. Everyone in my family raved over this recipe. 7 people in total and the toddler asked for more! Has anyone thought of trying to make it with chicken in place of beef? Just a thought. Your enchiladas look delicious, I would change out the flour tortillas for corn tortillas (more authentic). As mentioned in your comments a fried egg on top is very authentic. - instead of a baking sheet, use a spring form pan. The tortilla's fit perfectly. Cool/set, cut, and release the ring. so good but the bottom tortilla stuck completely to the baking sheet...maybe I didn't spray enough oil? Thank you for the recipe! I never leave comments, but I needed to for this recipe! I fixed this a few hours ago, and my husband is still raving about it! It's not only delicious, but it was so quick and easy to prepare! Thanks so much for sharing!